The Saint Bernard (also �St Bernard�, �St Bernhardshund�, or �Alpine Mastiff�) is a massive Swiss breed descending from the Roman Molossar and indigenous Swiss breeds. It was adapted in the seventeenth century to the purpose of mountain rescue at the Saint Bernard Hospice (named after an 11th century monk) in the Western Alps. The Saint Bernard would find lost travelers, lick them, and lie near them to warm them (they did not carry small barrels of brandy from their necks, as is often portrayed). The Saint Bernard continued in this role for centuries, saving thousands of lives. Prior to the 19th century the Saint Bernard was known as the �Saint Dog� or �Barry Dog�, after a Saint Bernard from the early 1800�s who saved over 40 lives. 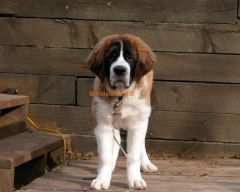 Saint Bernards decreased in numbers in the 1800�s due to disease (and, by some sources, avalanches). They were crossed with the Newfoundland and other breeds to improve their numbers, introducing a long-coated variety. Today, the Saint Bernard is among the most popular large breeds. Famous Saint Bernards include Stephen King�s �Cujo��actually, never mind� Famous Saint Bernards include Beethoven, hero of the �Beethoven� series of films and Bamse, mascot of the Free Norwegian Forces in World War II, who served on board a navy ship and was awarded the �animal� George�s Cross. Bamse was known to ride the bus to the local watering hole by herself and bring crew members back to the ship before curfew. 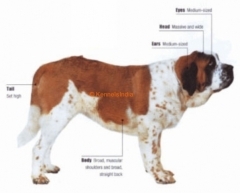 The Saint Bernard has a shoulder height of 65-70 cm (25-28 in) and weighs at least 60 kg (132 lbs), up to 136 kg (300 lbs). The largest Saint Bernard on record, Benedictine, weighed 162 kg (357 lbs)! Saint Bernards have a large head with large upper lips (�flews�), short, deep muzzle, and wrinkled forehead. They have a flat back, muscular legs, a broad, low-carried tail, and large feet. The Saint Bernard is a large powerhouse of an animal. The Saint Bernard is friendly and good-natured. It will defend its owner and territory when threatened. The Saint Bernard is intensely loyal. It is likely to slobber.